What Are The Everglades Like On An Everglades Airboat Tour? It’s hard not to fall in love with the Everglades when you first see it. Whether from a picture online or when flying overhead, the vast great wetlands that once covered all of South Florida. The Everglades has decreased in size as the area has been developed by humans throughout the years. Yet, what remains is still a gorgeous natural treasure. That said, no picture or overhead flight will ever do the Everglades justice. Unfortunately, hiking trails and car paths are limited as the Everglades is wetlands, making land travel difficult. This makes boats the key form of travel if you want to traverse the Everglades. Most boats can’t get through the dense Mangrove forests and saw grass plains. This makes traveling on an Everglades airboat tour the best way to really experience the Everglades up close and personal. Airboat Rides Fort Lauderdale proudly offers the best Everglades tours year-round to visitors from around the world. Whether you live right next door in Miami or across the world in Sydney, an Everglades airboat tour can and will blow you away. One of the best parts about going on an airboat tour in the Everglades is that no two tours are identical. Despite decreasing in size, the Everglades is still massive. 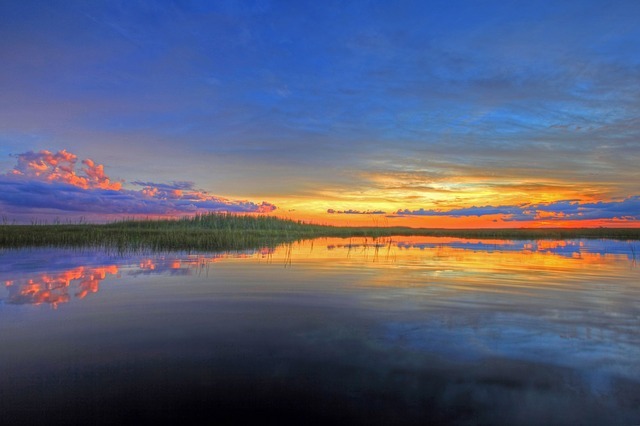 Over 800 square miles of land, the Everglades dominates a large portion of Central and South Florida. The Airboat Rides Fort Lauderdale Everglades tour begins as soon as you board one of our custom-built airboats. You’ll finally be face to face with the wild and untamed Everglades, along with everything that lives within it. We’ll glide across the water at high speeds as you take in the gorgeous scenery around you. Beds of saw grass can be seen as far as you can look. We’ll traverse through the Mangrove forests, and out into the open waters. Throughout your Everglades airboat tour, our skilled and knowledgeable captains will educate you along with other passengers on certain topics about the Everglades, such as its rich history. There’s also a wide range of hidden gems throughout the Everglades that are definitely worth seeing. As the Everglades are untamed, so are the animals that live within it. While we can’t guarantee you’ll see them, the Everglades is famously home to American Alligators, as well as the Florida Panther, Great egret, and Bald Eagle, among hundreds of birds and fish species. If you’re lucky, you’ll be able to see the majestic sunset over the water as the sky turns to a gorgeous orange and purple. Its reflection off the water makes for one of most incredible moments you’ll ever get to witness. We’ll conclude your Airboat Rides Fort Lauderdale Everglades tour by returning back to dock we started from. The Everglades are too vast and remarkable to pass up on. If you have the opportunity, join us on an Everglades airboat tour and see for yourself how incredible it truly is. If you’re interested, contact Airboat Rides Fort Lauderdale today by calling us at (954) 338-4890 and experience the Everglades the way it was intended.